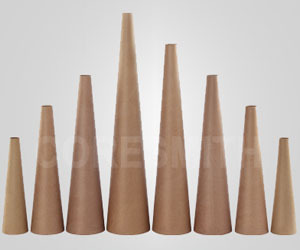 We are the manufacturers of Construction cones (Paper Conical Bolt Boxes ) in waxed & unwaxed surface. We can Supply you in various sizes especially in the following dimensions. A waxed Card Board Cone can be cut away when no longer required. A Conical Waxed Card Board tube is used for Positioning (Holding down) bolts.